Amelie grows up a lonely, imaginative child. As an adult, she is involved with the world; for example, she works as a waitress, has her own apartment. But she is still separate, more the observer than the participant. In part because of the death of Lady Di, she gets inspired to tinker in the lives of those around her, with mixed results. 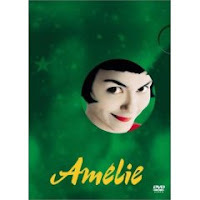 Amelie is a French film, with English subtitles. As you know, I love films; I love TV. (More on that in another post.) One of things I love about films from other countries is that they show things that books cannot. No matter how well a book is written, a book cannot do what film can; here, it could not capture Amelie's apartment, her dress, her Parisian neighborhood, the non-verbal interaction of the customers at the cafe. A side note about her apartment: I do get a bit house obsessed. So, while watching, I thought, wow, that's a great apartment on what a waitress makes! I almost wanted to rewatch on freeze-frame the apartment scenes. *I have recently switched jobs. I thought, hm, if I use the local library, I risk late fees. I know how I am. Better to pay to Netflix than the late fees. And I love the convenience. **News on the housing front. Stay tuned. I'm generally a lurker her but had to comment on this post. I have absolutely adored Amelie for years (although I only have it on VHS and no longer have a VCR). I especially love the scene in the restaurant when she melts. I mean, who *hasn't* felt exactly like that before? The subtle mix of fantasy and reality is fantastic. Wonderful wonderful film. One of my all-time favourites. I'm with you on this. I loved Amelie, and I noticed her apartment and thought the same thing!